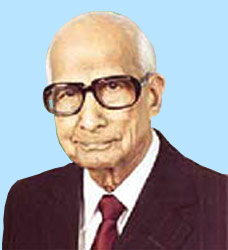 G.D. Birla was a great architect of India's industrial growth. He started his career in Calcutta at the beginning of this century. He entered the field of business during the days of the First World War and established himself after the war years. He established a cotton mill in Sabzi Mandi, Delhi followed by Keshoram Cotton Mills and Birla Jute Mills around 1920. In 1919, with an investment of 50 lacs, the Birla Brothers Limited was formed and thereafter a mill was set up in Gwalior. In the decade of the 30's he set up Sugar and Paper mills. From 1943 to 1946, Birla Brothers ventured into the area of cars. He had also established Ruby, Asiatic Insurance Co and Inland Air Service. After independence, the Birlas expanded their business and started production in many fields. Near Mirzapur, he, in collaboration with Caesar, an American friend, set up an Aluminum Plant 'Hindalco'. He also started many educational Institutions. To his credit go many temples, planetariums and hospitals. During the decades of 70's and 80's, Birla brothers were among the topmost Industrial Houses of India. G.D. Birla award for scientific Research has been established to encourage scientists for their contribution in the various fields of scientific Research.